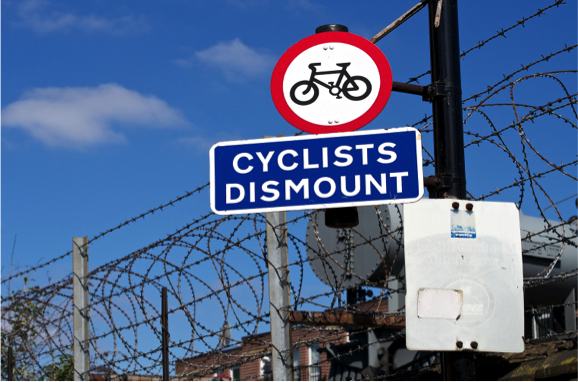 "Cyclists dismount” signs, signalling cyclists to get of their machines, are often found at the end of cycle paths or where there is a road crossing. These signs are advisory only and you will not be committing an offence if you ignore such signs. However, these signs may be placed in a location where there may be a significant increase in the danger to yourself or other users of the highway. The best course of action would be to treat these signs as warning signs as opposed to instructions. That being said, there are some signs that should always be obeyed by cyclists as users of the road. Signs that are surrounded by a red circle are signs warning of mandatory instructions. The picture below shows the difference between the two types of sign. The top one is an advisory notice whereas the bottom one is a warning sign of mandatory instructions as there is a red circle around the bicycle sign accompanying the ‘cyclists dismount’ sign.